Looking for hobby ideas? Registration is open for Mindfulness of Knitting! We will be making the Outlander Transportation to 1743 shawl. This is a three-color, triangular shawl in garter stitch. That’s right, only using the knit stitch; very little purling in this project. This pattern is for those who have knit before. 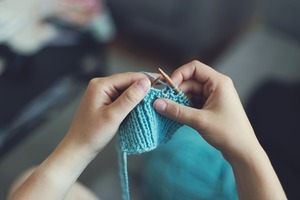 True beginners, who have never knit before, are also welcome to attend the class. I have a different project to get you started.